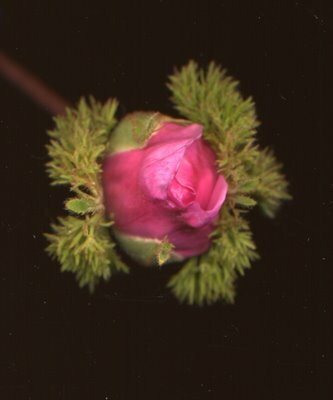 This old moss rose reminds me of my friend Celia Duthie. 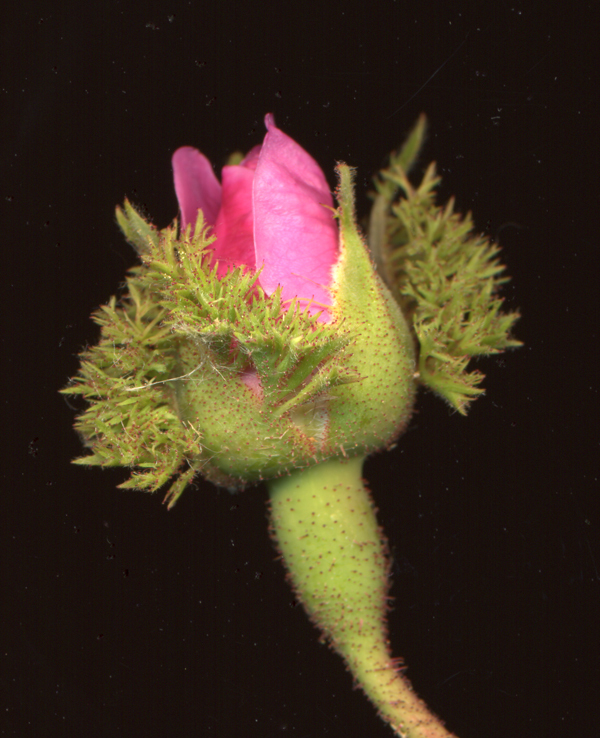 The rose is sometimes called Chapeau de Napoleón because it resembles his tri cornered hat. It reminds me of Celia because I feel that she is in exile on Saltspring Island. She is away from Vancouver where she was one of the women that made our city a vibrant one. We need women like Celia I think of her as being in exile on Elba. She is bound to return. When you rub your fingers on the "moss" of this rose your fingers smell, startingly, of pine resin. Dancer Shay Kuebler walked into my studio last week and with much excitement he pulled a couple of shoes from a bag. "I want to show some of the many things I do, he said. 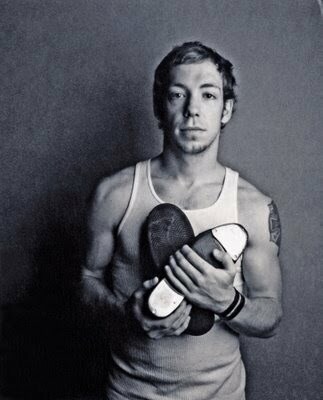 "I dance with my street shoes and I love my tap shoes." I had never seen a tap shoe except during a performance. I wasn't aware there was so much metal in one. I thought that dancers nailed old Coke caps to their shoes. What you see here is the first photo I took. It is a Polaroid test. I use Polaroids before I switch to "real" film. But a scanned Polaroid is a thing of beauty. At least I think so. In late October 1979, stopped at a light on Lougheed Highway and Willingdon Avenue, I could feel the stares from other cars. The reason was my passenger, Daisy Duck. Vancouver's 9th Empress was applying lipstick on his lips. 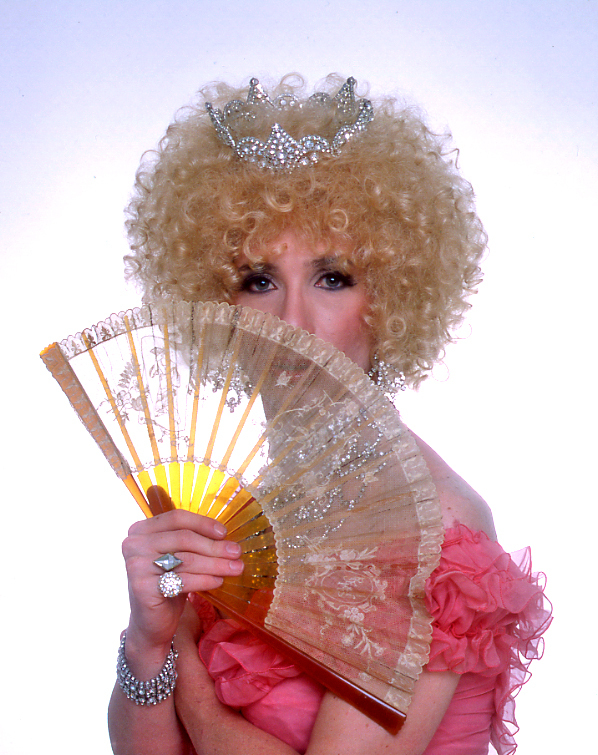 The idea of two men with moustaches holding hands on Davie Street (pretty common then) was completely alien to we who lived in Burnaby, so the sight of an orange-wigged drag queen was even more startling. Yet the burgeoning gay scene of Vancouver had been kind to my photographic career. Earlier that month, I had come to the realization that I needed a studio flash system. So I went to my local Bank of Montreal, on Willingdon and Hastings, and explained to the dour, gray-haired, Scottish loan officer that I wanted $2000. "What do you propose to offer as collateral?" she asked. 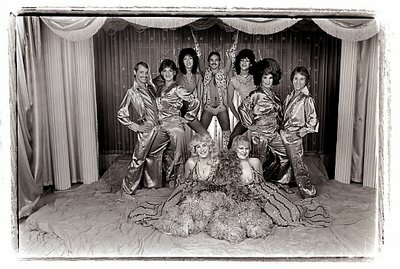 I placed on her desk a thick pile of Bi-Lines , a gay tabloid published by Ron Langen in Vancouver between 1978 and 1979. She eyed the centrefolds. With a barely perceptible smile she said: "I see you sometimes used a fine Scottish name as a nom de plume." 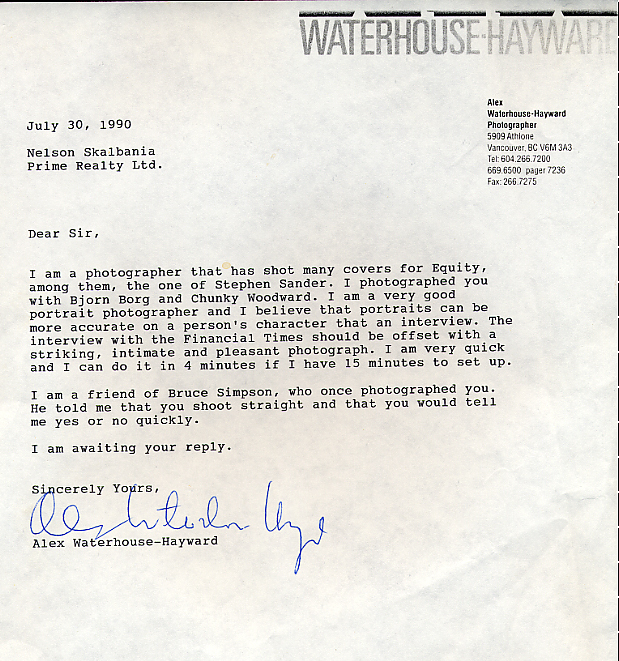 In the earlier issues of Bi-Line, my photos had been credited to Strut McPherson. My first use of the new flash system was to photograph Daisy Duck and the Halloween show at BJ's, the gay basement club at 339 West Pender (the building, a heritage site was purchased years later by Mark James) that operated between Dec. 4, 1970 to Oct. 17, 1982. For some years my pre-teen daughter, Ale, would show the pictures, such as the one here, to her friends with the challenge to guess which one was the only woman. During the late '70s and early '80s, before the AIDS plague changed it all, it was fashionable for straights to go on gay club/pub crawls. These included the Shaggy Horse, the Luv-a-Fair and the Gandy Dancer. The more daring would attend the mid-afternoon tea parties at the venerable Faces on the corner of Seymour and Robson. But for real fun, the reviews at BJ's couldn't be topped. My faves were the elaborately staged and lip-synced versions of Blondie songs like Heart of Glass. Until BJ's closed, I would often go to co-owner Brian to borrow costumes for my shoots. 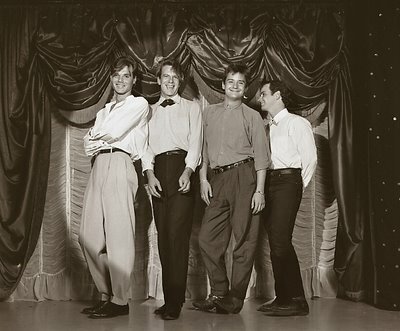 In 1982, I photographed Art Bergmann and his band Poisoned at BJ's. Art was going through a gay/glam period. I remember Sam Feldman (Art's music agent in Vancouver at the time.) being shocked at my pictures. "They look like fags," he said. I last saw Brian at a photography course I taught for Emily Carr's outreach program in B.C. 's interior in 1989. Brian was one of my students. He winked at me and in a whisper told me: "This is a quiet community, so I would appreciate your discretion." Sometime in 1999 showing my pictures to Jim the former DJ at BJ's he informed me that Daisy was no longer with us as we looked back on what to both of us were far rosier times. And when Ale's friends would give up, she would say, "The woman is at the bottom row, right." On Tuesday, February 20, 2001 I was profoundly affected by a little picture on the top right of the Living Arts section of the New York Times. I discovered a man the day he died. In the early 60s I was studying engineering at the University of the Americas in Mexico City. I was having problems diferentiating among resistance, capacitance and inductance. I was no better at strength of materials. Engineering was not to be my career. I spent most of my time drinking strong coffee with my painter (very bohemian) friend Robert Hijar whose parents worked for the CIA. Robert had loads of girlfriends who seemed to spend days (and nights) with him in studios and lofts. They were not interested in my talk of slide rules and Brownian movement. I could not ride Robert's artistic coat tails. I was completely ignorant on all things art. A friend of Robert's asked me once, "Have you heard Carmina Burana?" I innocently and stupidly replied, "No, who's she?" With Robert we went to baroque concerts in old Mexico City churches and museums or we listened to avant-garde music or jazz at the Benjamin Franklin Library. I learned to love the smell of paint at the large studio at the university where Robert painted. I began to appreciate art. I even met his teacher Gunther Gerzso. It was Robert who taught me to develop and print film. I owe him my artistic life as well as my profession. But in spite of Robert my comprehension of art history has been spotty in many places. 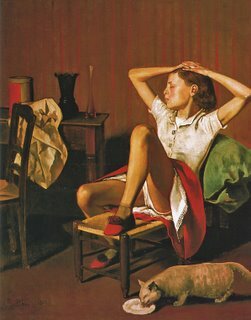 On that Tuesday, February 20, 2001 Balthus struck deep in my brain and became an inspiration. I had no previous knowledge of him but I made up for lost time. 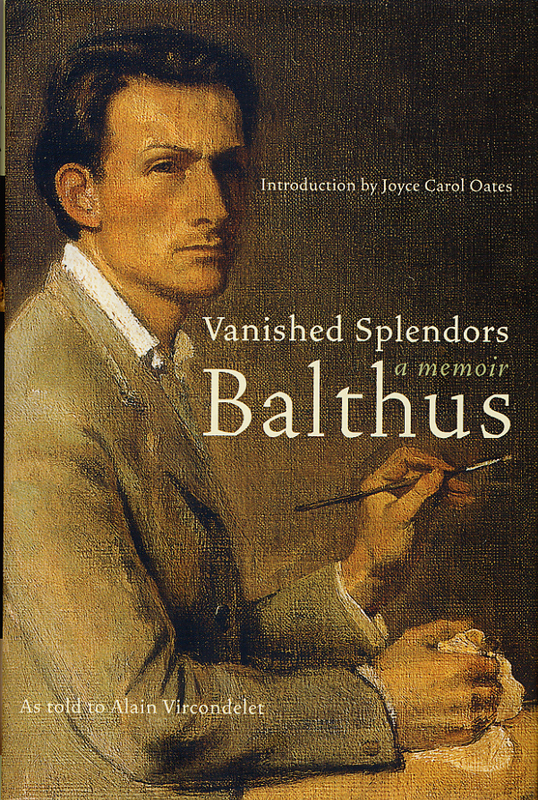 I cut out the article called Giuliani, Meet Balthus: Trying to Root Out 'Obscenity'. From that point on I have read everything I could get my hands on about the mysterious count who was no count. 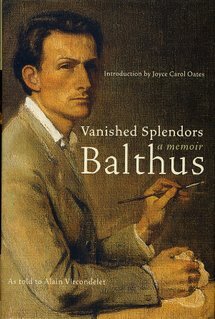 I bought his books, when I could find them, as many bookstores refused to carry them. I read about his infamous 1934 painting The Guitar Lesson which had not been exhibited or seen by anyone for years. As you can see here the internet cut to the chase and made it instantly viewable. I told my model friend Helen and she was interested in doing some b+w approximations of some of Balthus's paintings. We chose the Marble Arch Hotel as our headquarters for the session. No one thinks about what painting really is, a skill like that of a laborer or farmer. It's like makaing a hole in the ground. A certain physical effort is needed in relation to the goal one sets for oneself. It is a discernment of secrets and illegible, deep, and distant paths that are timeless. In this sense modern painting has failed. I knew Mondrian well, and miss what he depicted early on, some fine trees for example. He looked at nature and knew how to paint it. And then one day he fell into abstraction. On a lovely day toward evening, when the light was barely starting to fade, I went to see him with Giacometti. Alberto and I looked at the magnificence happening outside the window, a setting of twilight glow. Mondrian pulled the shades, saying he didn't want to see it anymore. I always regretted his transformation and upheaval. Later Compositions of modern art were assembled by pseudo-intellectuals who neglected nature, and became blind to it. That's why I always fiercely relied on my own resources and the notion that painting is, above all, a technique, like sawing wood, or making a hole somewhere, in a wall or the ground. Sixty-year old Halifax native Sean Rossiter's interests are varied. From July 1975's Spartacus on the Fairview Slopes Rossiter wrote 110 monthly "12th & Cambie" columns on civic affairs for Vancouver Magazine until his last in August 1991: Fire & Speed about Russian MIG test pilot Valery Menitzki. City Politicians in the know automatically went to Vancouver's last page to read Rossiter's column. Fire & Speed revealed an interest close to his heart: airplanes. In 1996 Rossiter published his first airplane book, The Immortal Beaver - The World's Greatest Bushplane and another Otter; Twin Otter. Rossiter (an old time goalie since he was 35) has written books on hockey and, Douglas & McIntyre has just published City Making In Paradise - Nine Decisions That Saved Vancouver by Mike Harcourt and Ken Cameron with Sean Rossiter. 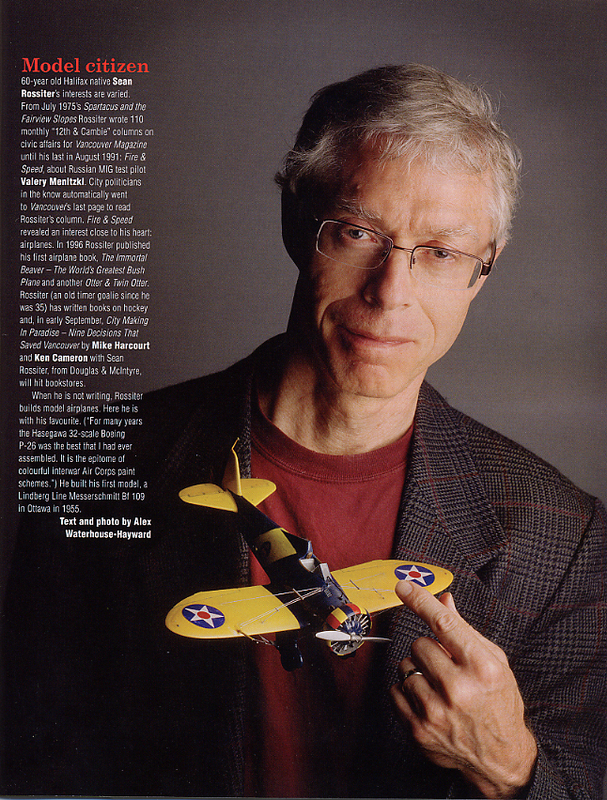 When he is not writing, Rossiter builds model airplanes. Here he is with his favourite. ("For many years the Hasegawa 2-scale Boeing P-26 was the best that I had ever assembled. It is the epitome of colourful interwar Air Corps paint schemes.") He built his first model, a Lindberg Line Messerschmitt Bf 109 in Ottawa in 1955. The above has appeared in the September issue of VLM. The Radeon™ 9550 delivers an exceptional visual experience for the value minded gamer and PC enthusiast. With 128 bit and DDR memory and impressive processor speed of its innovative .13micron visual processing unit (GPU), the Radeon™ 9550 takes you to a world of lush graphics with a stutter free experience. Its 4 pixel rendering pipelines with a fill rate of 1.0 giga-pixels per second combine to deliver dramatic image detail which adds to great 3D game play and a immersive video playback experience! 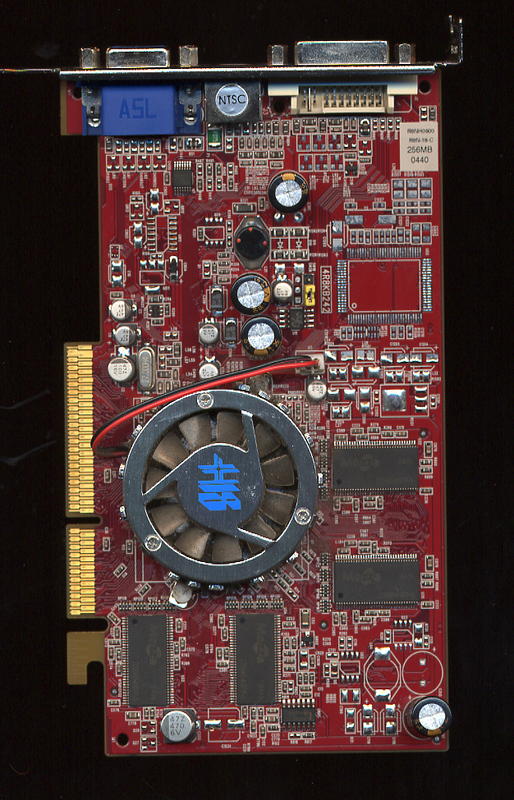 The device on the left, a Radeon 9550, is called a video card. 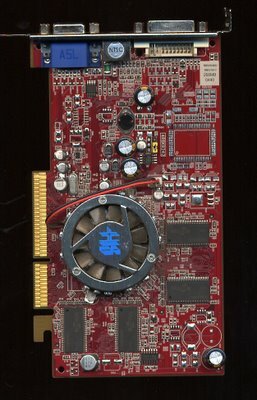 Neither a video card nor the substantially more important mother board of my computer resemble either a card or a board as much as resembling each other. My video card looks like a small mother board. Those of us who don't know would probably call them circuit boards. This particular video card is the one that made my computer fail more than a week ago. For months I had suspicion that something was wrong as I had fine, pale vertical yellow lines going through my screen on anything that was completely white. When the card finally failed (but not completely) my computer only worked on safe mode. 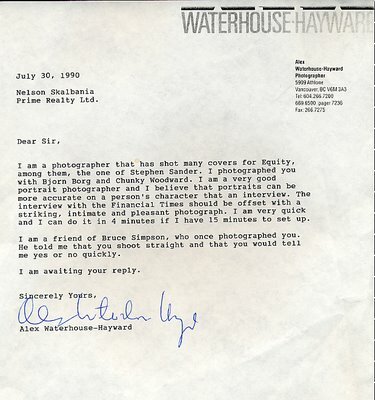 I quickly realized that my business of photography was at a standstill. On safe mode the scanner and printer did not work. Without a scanner I could not send by email pictures to my clients. Without the printer I could not print out my invoices on letterhead which I then sign, scan and send by email for usually quick payment. But most obvious was setting up appointments to photograph people who were either very busy and or out of town. A phone will do in some cases but I had the difficult task of nailing down three very busy persons, ex premier Mike Harcourt, Darlene Marzari and Shirley Chan to show up at the same place, at the same time and on the same day. Fortunately my email worked. Years ago when I had to do these multiple persons in one single photograph the most difficult task was never the taking of the photograph as getting the people to show up. Before email (I did not log on until January 1995 and my email was the whimsical alexwh@wimsey.com)on July 30, 1990 I had to resort to the then state of the art fax to communicate with busy politicians, actors, actresses and businessmen. One in particular I had been told I had a slim chance of getting to pose. Nelson Skalbania was aware that an unflattering article was being written for a Toronto business paper called the Financial Times. When Rebecca asked me, "Why does Charles have that scar on his face?" 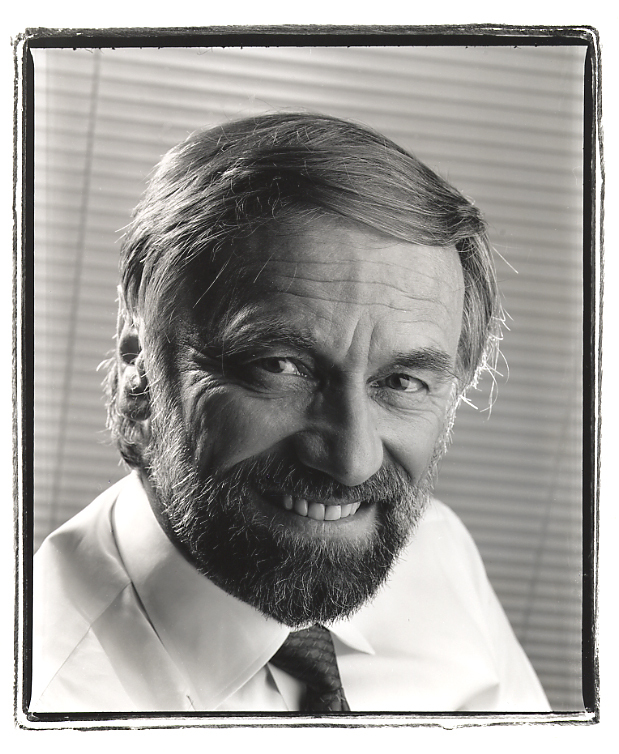 I was hit by a barrage of emotion as I remembered a photograph I had taken of Charles Campbell in my living room in April of 1997. Rebecca asked me this at the tail end of a lovely garden party at the house of Maja Grip and Jack MacDermot which celebrated their recent elopement. Many of our mutual friends were there including a "very tall and fit man with a bald head and a funny name you are going to like Rebecca, his name is Oraf." Paul and Audrey Grescoe were there and I always love to chat with them. The blood in their veins is a fifty fifty blend of blood and pressed magazine juice. We talked magazines, books, editors (specially Mac Parry). The food was as good as home made food can get. Rebecca thinks Maja is a gourmet cook and I would not disagree with her. This was most evident in the end when Maja handed us little cones of lavender/honey and black pepper/lime ice cream. Jack and Maja's invite announced their party as a champagne tea (I would argue with Maja that Champagne had to be capitalized). Jack offered me some Spanish bubbly but I informed him that was not Champagne. He immediately corrected his error (those frugal Scots) and poured me some of the real thing. 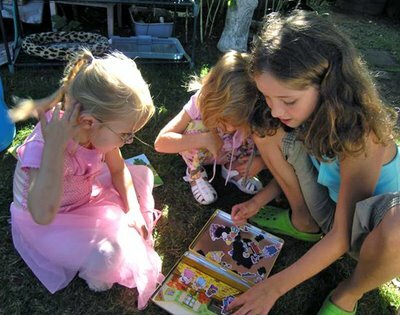 But the best part of the party was seeing my granddaughters playing with Charles and Lainé's daughter Calla. There is something idyllic in seeing children (particularly little girls) play in a garden while oblivious of the presence of adults conversing amongst them with drinks in hand. It was what a late summer party should be. But I thought of Rebecca's question. 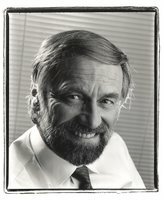 I would assert that half the photographs of artists, dancers, singers, politicians, environmentalists that are the bulk of my very large photo files came from Georgia Straight assignments when Charles Campbell was editor. 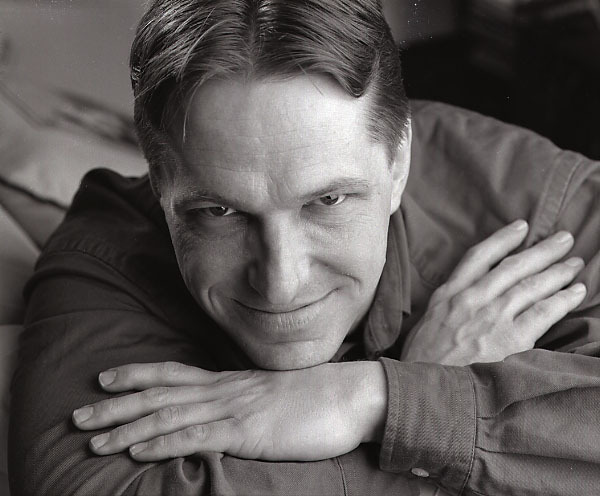 Campbell went to political rallies, PR movie functions, theatre, ballet, etc. He was an editor (unique in our city) who had a real perception of the pulse of our city. Vancouver needs somebody like him. While he was editor I remember conversing with a depressed John Lekich. I told John, "Let's find a blond for you to write about and that I can photograph and you will feel better." We went to Campbell who looked at us a dubiously and then said, "Do it." We did. Sometime in early 1997 Campbell noticed a loss of feeling in his face. He became worried and saw a doctor. After many tests they determined that he had a schwannoma , which is a tumor (almost always benign) afflicting the Schwann cells that make up the nerve sheath. This tumor was lodged behind Campbell's upper nose and between his eyes. To remove the tumor a surgeon had to enter Campbell's mouth and "scoop" the tumor out. This was an extremely dangerous operation. Campbell showed up at my door wanting me to photograph his face before surgeons took it appart and, besides,(left unsaid but I understood) my pictures could be his last. After the successful operation the tumor was found to be cancerous. To date Campbell is just fine and able to smile at life even though his father recently died at age 96. Perhaps it all has to do with seeing your daughter play in a garden party while surrounded by friends. Photograph of Calla, Lauren and Rebecca by Charles Campbell. To remove the tumour the surgeon had to cleave his face open from his eye to his mouth, poke a hole in his cheekbone, go through his sinuses and scoop the tumour out of the middle of his head." They didn't do that in the first surgery, even though I was told they would; they went in under my lip so I wouldn't have a scar, but they did the full-on scar-leaving thing the second time. Dad died last Sunday at 93. And a further correction: Jack MacDermot states that as an Irishman he is not frugal about his Champagne. He further stated that he bought one real bottle of Champagne for me and that on the question of Scots and the Irish we Bolivians should know our geography better.